QT (QuikTrip) is headquartered in Tulsa, Oklahoma. The company was looking for heating systems for one of their high volume production locations in Belton, MO. This location makes salads, bakery items, sandwiches and more for more than 590 of their gas stations located across the country. These items are prepared in rooms that are essentially walk-in coolers. The temperature in these rooms hovers around 35 degrees F during production. At the end of each production shift, the rooms are cleaned. QT chose five AbsolutAire AA-Series direct-fired units to quickly heat and dry out each of these walk-in coolers between shifts. After the rooms are washed down, the units energize and fill the rooms with very hot air very quickly. Low temperature limit switches were also provided on every unit to turn off the supply fans in the event of burner failure. This ensures that production levels remain constant and that precious time is not lost between shifts. 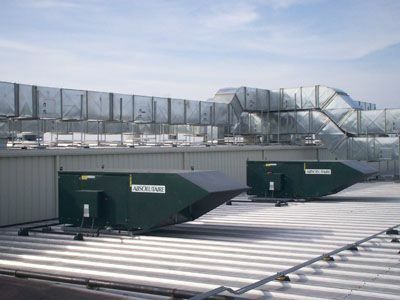 Each unit was also equipped with 1" aluminum filters mounted in the inlet hoods to limit the amount of foreign contaminants entering the clean rooms.